Would you like to control the way your backup program performs its tasks? Would you like to back up your files onto local drives, removable drives or servers? Would you like to achieve these free of charge? Then Personal Backup is your ideal choice. 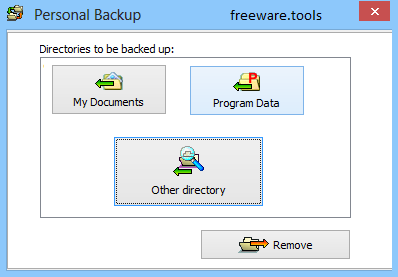 The free backup software will help you save your files to any destination folder you like. The program will also help you make multiple backups without unnecessarily storing duplicate files, as it only saves new files and newer versions of files already backed up. It accommodates as many configurable backup tasks as the user want. There’s an abundance of similar utilities on the market, possibly offering you a richer array of features but they come with a fee, which Personal Backup doesn’t require in order to do its job. The former category is offered a step-by-step wizard that guides one throughout the whole process, while the latter is provided with a more complex way of configuring the backups. You can backup data from a removable or fixed drive, a FTP or a Windows network server, with no limit to the number of backups. By default, the program processes all the subfolders of the specified folder, but exceptions can be defined to exclude or include any subdirectory, as you wish. Backups can be performed on demand or on a predefined schedule, as well as set for launch at computer startup. Moreover, you can select from four different type of backups: copy, full, differential (compares two folders and saves only the newest data) and incremental (backs up the files that have changed from the last backup). Other highlights include custom compression rules, file encryption, file sync, as well as options to copy file permissions or to perform integrity checks on the backups. All in all, Personal Backup comes across as an excellent utility that sports a sufficient array of features for the day-to-day user, being able to backup and restore data in simple, easy to follow steps.